Diagram of both the TC-NER and GG-NER pathways. The two pathways differ only in initial DNA damage recognition. Nucleotide excision repair is a DNA repair mechanism. DNA damage occurs constantly because of chemicals (i.e. intercalating agents), radiation and other mutagens. 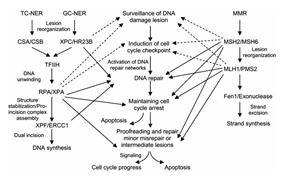 Three excision repair pathways exist to repair single stranded DNA damage: Nucleotide excision repair (NER), base excision repair (BER), and DNA mismatch repair (MMR). While the BER pathway can recognize specific non-bulky lesions in DNA, it can correct only damaged bases that are removed by specific glycosylases. Similarly, the MMR pathway only targets mismatched Watson-Crick base pairs. Nucleotide excision repair (NER) is a particularly important excision mechanism that removes DNA damage induced by ultraviolet light (UV). UV DNA damage results in bulky DNA adducts - these adducts are mostly thymine dimers and 6,4-photoproducts. Recognition of the damage leads to removal of a short single-stranded DNA segment that contains the lesion. The undamaged single-stranded DNA remains and DNA polymerase uses it as a template to synthesize a short complementary sequence. Final ligation to complete NER and form a double stranded DNA is carried out by DNA ligase. NER can be divided into two subpathways: global genomic NER (GG-NER or GGR) and transcription coupled NER (TC-NER or TCR). The two subpathways differ in how they recognize DNA damage but they share the same process for lesion incision, repair, and ligation. The importance of NER is evidenced by the severe human diseases that result from in-born genetic mutations of NER proteins. Xeroderma pigmentosum and Cockayne's syndrome are two examples of NER associated diseases. Nucleotide excision repair is more complex in eukaryotes than prokaryotes, but the general principle is similar. There are 9 major proteins involved in NER in mammalian cells. Deficiencies in certain proteins leads to disease; protein names are associated with the disease. XPA, XPB, XPC, XPD, XPE, XPF, and XPG all derive from хeroderma pigmentosum and CSA and CSB represent proteins linked to Cockayne syndrome. Additionally, the proteins ERCC1, RPA, RAD23A, RAD23B, and others also participate in nucleotide excision repair. A more complete list of proteins involved in NER is found below. 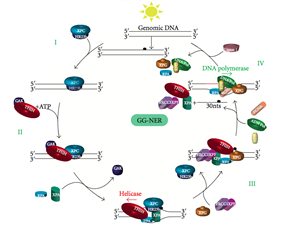 Eukaryotic nucleotide excision repair can be divided into two subpathways: global genomic NER (GG-NER) and transcription coupled NER (TC-NER). Two different sets of proteins are involved in recognizing DNA damage for each subpathway. After damage recognition, the two subpathways converge for the steps of dual incision, repair, and ligation. Schematic depicts binding of proteins involved with GG-NER. Global genomic NER repairs damage in both transcribed and untranscribed DNA strands in active and inactive genes throughout the genome. - this process is not dependent on transcription. This pathway employs several "damage sensing" proteins including the DNA-damage binding (DDB) and XPC-Rad23B complexes that constantly scan the genome and recognize helix distortions: the XPC-Rad23B complex is responsible for distortion recognition, while DDB1 and DDB2 (XPE) can also recognize some types of damage caused by UV light. Additionally, XPA performs a function in damage recognition that is as yet poorly defined. Upon identification of a damaged site, subsequent repair proteins are then recruited to the damaged DNA to verify presence of DNA damage, excise the damaged DNA surrounding the lesion then fill in the repair patch. Schematic depicts binding of proteins involved with TC-NER. At any given time, most of the genome in an organism are not undergoing transcription; there is a difference in NER efficiency between transcriptionally silent and transcriptionally active regions of the genome. For many types of lesions, NER repairs the transcribed strands of transcriptionally active genes faster than it repairs nontranscribed strands and transcriptionally silent DNA. TC-NER and GG-NER differ only in the initial steps of DNA damage recognition. The principal difference between TC-NER and GG-NER is that TC-NER does not require XPC or DDB proteins for distortion recognition in mammalian cells. 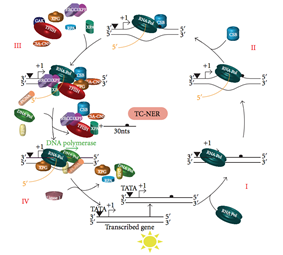 Instead TC-NER initiates when RNA polymerase stalls at a lesion in DNA: the blocked RNA polymerase serves as a damage recognition signal, which replaces the need for the distortion recognition properties of the XPC-RAD23B and DDB complexes. CS proteins (CSA and CSB) bind some types of DNA damage instead of XPC-Rad23B. Other repair mechanisms are possible but less accurate and efficient. Transcription factor II H (TFIIH) is the key enzyme involved in dual excision. TFIIH and XPG are first recruited to the site of DNA damage (XPG stabilizes TFIIH). The TFIIH subunits of XPD and XPB act as a 5'-3' and 3'-5' helicase, respectively - they help unwind DNA and generate a junction between the double-stranded and single-stranded DNA around the transcription bubble. In addition to stabilizing TFIIH, XPG also has endonuclease activity; it cuts DNA damage on the 3' side while the XPF–ERCC1 heterodimeric protein cuts on the 5' side. The dual incision leads to the removal of a ssDNA with a single strand gap of 25~30 nucleotides. The small, excised, damage-containing DNA (sedDNA) oligonucleotides are initially released from the duplex in complex with TFIIH but then dissociate in an ATP-dependent manner and become bound to RPA. Inhibition of gap filling DNA synthesis and ligation results in an accumulation of RPA-bound sedDNAs in the cell. Replication protein A (RPA) and XPA are the last two proteins associated with the main NER repair complex. These two proteins are present prior to TFIIH binding since they are involved with verifying DNA damage. They may also protect single-stranded DNA. After verification, the 5' side incision is made and DNA repair begins before the 3' side incision. This helps reduce exposed single stranded DNA during the repair process. Replication factor C (RFC) loads the Proliferating Cell Nuclear Antigen (PCNA) onto the DNA strand. This allows DNA polymerases implicated in repair (δ, ε and/or κ) to copy the undamaged strand via translocation. DNA ligase I and Flap endonuclease 1 or the Ligase-III-XRCC1 complex seal the nicks to complete NER. A schematic representation of models for the nucleotide excision repair pathway controlled by Uvr proteins. The process of nucleotide excision repair is controlled in Escherichia coli by the UvrABC endonuclease enzyme complex, which consists of four Uvr proteins: UvrA, UvrB, UvrC, and DNA helicase II (sometimes also known as UvrD in this complex). First, a UvrA-UvrB complex scans the DNA, with the UvrA subunit recognizing distortions in the helix, caused for example by pyrimidine dimers. When the complex recognizes such a distortion, the UvrA subunit leaves and an UvrC protein comes in and binds to the UvrB monomer and, hence, forms a new UvrBC dimer. UvrB cleaves a phosphodiester bond 4 nucleotides downstream of the DNA damage, and the UvrC cleaves a phosphodiester bond 8 nucleotides upstream of the DNA damage and created 12 nucleotide excised segment. DNA helicase II (sometimes called UvrD) then comes in and removes the excised segment by actively breaking the hydrogen bonds between the complementary bases. The resultant gap is then filled in using DNA polymerase I and DNA ligase. The basic excision process is very similar in higher cells, but these cells usually involve many more proteins – E.coli is a simple example. TC-NER also exists in bacteria, and is mediated by the TRCF (Mfd) protein. TRCF is an SF2 ATPase that uses ATP hydrolysis to translocate on dsDNA upstream of the transcription bubble and forward translocate RNA polymerase, thus initiating dissociation of the RNA Polymerase ternary elongation complex. 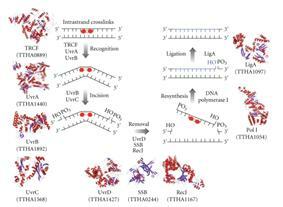 TRCF also recruits the Uvr(A)BC nucleotide excision repair machinery by direct physical interaction with the UvrA subunit. DNA excision pathways work in tandem to repair DNA damage. Unrepaired damage or malfunctioning proteins associated with excision repair could lead to unregulated cell growth and cancer. Though historical studies have shown inconsistent results, genetic variation or mutation to nucleotide excision repair genes can impact cancer risk by affecting repair efficacy. Single-nucleotide polymorphisms (SNPs) and nonsynonymous coding SNPs (nsSNPs) are present at very low levels (>1%) in the human population. If located in NER genes or regulatory sequences, such mutations can negatively affect DNA repair capacity resulting in an increase likelihood of cancer development. While the functional impact of all polymorphisms has not been characterized, some polymorphisms in DNA repair genes or their regulatory sequences do induce phenotypical changes and are involved in cancer development. A study of lung cancer cases found modest association between NER specific SNP polymorphisms and lung cancer risk. The results indicate that some inherited polymorphic variations in NER genes may result in predisposition to lung cancer, and potentially other cancer states. Two important genes in the NER pathway for which polymorphism has shown functional and phenotypic impact are the XPD and XPC genes. XPD, also known as ERCC2, serves to open DNA around the site of damage during NER, in addition to other transcriptional activities. Studies have shown that polymorphisms at Exon 10 (G>A)(Asp312Asn) and Exon 23 (A>T)(Lys751Gln) are linked with genetic predisposition to several cancer types. The XPC gene is responsible for a protein which recognizes DNA during the early portion of the NER pathway. This gene can have polymorphisms at Intron 9 and SNPs in Exon 15 which have been correlated with cancer risk as well. Research has shown that a biallelic poly (AT) insertion/deletion polymorphism in Intron 9 of XPC is associated with increased risk for skin, breast and prostate cancers, especially in North Indian populations. The study of a hereditary cancer, xeroderma pigmentosum has helped identify several genes which encode proteins in the NER pathway, two of which are XPC and XPD. XP is caused by a homozygous deficiency in UV DNA damage repair (TC-NER) which increases the patients’ risk of skin cancer by 1000-fold. In heterozygous patients, the risk of cancer is sporadic but can be predicted based on analytical assessment of polymorphisms in XP related DNA repair genes purified from lymphocytes. In a study relapse rates of high-risk stage II and III colorectal cancers, XPD (ERCC2) polymorphism 2251A>C was significantly correlated with early relapse after chemotherapeutic treatment. Studies have indicated that the effects of polymorphic NER genes is additive, with greater frequency of variants, greater cancer risk presents. ^ Fuss JO, Cooper PK (June 2006). "DNA repair: dynamic defenders against cancer and aging". PLoS Biol. 4 (6): e203. ^ Carroll SB, Wessler SR, Griffiths AJFl, Lewontin RC (2008). Introduction to genetic analysis. New York: W.H. Freeman and CO. p. 534. ^ a b Le May N, Egly JM, Coin F (2010). 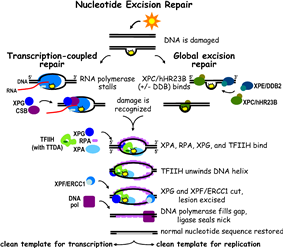 "True lies: the double life of the nucleotide excision repair factors in transcription and DNA repair". J Nucleic Acids 2010. ^ Morita R, Nakane S, Shimada A, et al. (2010). "Molecular mechanisms of the whole DNA repair system: a comparison of bacterial and eukaryotic systems". J Nucleic Acids 2010: 179594. ^ Truglio JJ, Croteau DL, Van Houten B, Kisker C (February 2006). "Prokaryotic nucleotide excision repair: the UvrABC system". Chem. Rev. 106 (2): 233–52. ^ Zhang Y, Rohde LH, Wu H (June 2009). "Involvement of nucleotide excision and mismatch repair mechanisms in double strand break repair". Curr. Genomics 10 (4): 250–8. ^ Kwok PY, Gu Z (December 1999). "Single nucleotide polymorphism libraries: why and how are we building them?". Mol Med Today 5 (12): 538–43. ^ Karahalil B, Bohr V, Wilson D (October 2012). "Impact of DNA polymorphisms in key DNA base excision repair proteins on cancer risk". Hum Exp Toxicol 31 (10): 981–1005. ^ Sakoda LC, Loomis MM, Doherty JA, Julianto L, Barnett MJ, Neuhouser ML, Thornquist MD, Weiss NS, Goodman GE, Chen C (2012). "Germ line variation in nucleotide excision repair genes and lung cancer risk in smokers". Int J Mol Epidemiol Genet 3 (1): 1–17. ^ Hou SM, Fält S, Angelini S, Yang K, Nyberg F, Lambert B, Hemminki K (April 2002). "The XPD variant alleles are associated with increased aromatic DNA adduct level and lung cancer risk". Carcinogenesis 23 (4): 599–603. ^ Wang M, Gu D, Zhang Z, Zhou J, Zhang Z (2009). "XPD polymorphisms, cigarette smoking, and bladder cancer risk: a meta-analysis". J. Toxicol. Environ. Health Part A 72 (11–12): 698–705. ^ a b Mittal RD, Mandal RK (January 2012). "Genetic variation in nucleotide excision repair pathway genes influence prostate and bladder cancer susceptibility in North Indian population". Indian J Hum Genet 18 (1): 47–55. ^ Blankenburg S, König IR, Moessner R, Laspe P, Thoms KM, Krueger U, Khan SG, Westphal G, Berking C, Volkenandt M, Reich K, Neumann C, Ziegler A, Kraemer KH, Emmert S (June 2005). "Assessment of 3 xeroderma pigmentosum group C gene polymorphisms and risk of cutaneous melanoma: a case-control study". Carcinogenesis 26 (6): 1085–90. ^ Shore RE, Zeleniuch-Jacquotte A, Currie D, Mohrenweiser H, Afanasyeva Y, Koenig KL, Arslan AA, Toniolo P, Wirgin I (May 2008). "Polymorphisms in XPC and ERCC2 genes, smoking and breast cancer risk". Int. J. Cancer 122 (9): 2101–5. ^ a b Qiao Y, Spitz MR, Guo Z, Hadeyati M, Grossman L, Kraemer KH, Wei Q (November 2002). "Rapid assessment of repair of ultraviolet DNA damage with a modified host-cell reactivation assay using a luciferase reporter gene and correlation with polymorphisms of DNA repair genes in normal human lymphocytes". Mutat. Res. 509 (1–2): 165–74. ^ a b Huang MY, Fang WY, Lee SC, Cheng TL, Wang JY, Lin SR (2008). "ERCC2 2251A>C genetic polymorphism was highly correlated with early relapse in high-risk stage II and stage III colorectal cancer patients: a preliminary study". BMC Cancer 8: 50. ^ Spitz MR, Wu X, Wang Y, Wang LE, Shete S, Amos CI, Guo Z, Lei L, Mohrenweiser H, Wei Q (February 2001). "Modulation of nucleotide excision repair capacity by XPD polymorphisms in lung cancer patients". Cancer Res. 61 (4): 1354–7. Ellenberger T, Friedberg EC, Walker GS, Wolfram S, Wood RJL, Schultz R (2006). DNA repair and mutagenesis. Washington, D.C: ASM Press. Frit P, Kwon K, Coin F, Auriol J, Dubaele S, Salles B, Egly JM (December 2002). "Transcriptional activators stimulate DNA repair". Mol. Cell 10 (6): 1391–401. Mellon I (September 2005). "Transcription-coupled repair: a complex affair". Mutat. Res. 577 (1–2): 155–61.